Jesus is headed to the cross. He knows that His time on earth is short. I can say with most certainty that I and probably the vast majority of the planet would be freaking out. “I’ve got to hide, God this can’t be Your plan. There must be another way”. But Jesus in his INCREDIBLE connection to The Father and unfathomable love for us prayed for us to experience joy. And not just any joy; but the FULL MEASURE OF HIS JOY. What is the FULL MEASURE OF JOY? What would it “feel” like to experience HIS full measure of joy? 33 “I have told you these things, so that in me you may have peace. It has been a long time since I have blogged. I have felt almost victimized by some of the choices I have made which I “thought” was of God but then began to question. Those changes I made have required me to get up at 4:30 every morning and deal with 2-3 hours of traffic commute every day. It has been nearly a year in this schedule and I have been completely depleted every day. With that I have had my morning blog time pushed out and have truly missed this morning soul food. I would sleep in my car at lunch and sleep in my car between work and evening church endeavors (life groups, recovery meetings, bible studies). God has been pressing on my heart incredibly loudly for months however that discipline is the key to experiencing His incredible joy and peace. Obedience to His word and His will produces the kind of joy and peace that I’ve hungered for for many years. As I seek to comprehend His love just a little more I begin to realize more and more that it’s not about where I’m going or what I’m doing; He only cares about WHO I AM. Through discipline and obedience to His word we gain the capacity for greater levels of love and sacrifice for His glory and that can benefit all mankind. We begin to feel Him closer, hear Him clearer, and more fully discover and align ourselves with His calling. As we positionaly become more deeply connected to the One who gave us life and gives us purpose, power and freedom, our circumstances become secondary to the love relationship we have with Our Creator and Savior. We then become empowered as masters over our circumstances. No more striving, no more having to live under the oppression of the world’s standards or the lies fed from a broken childhood of having to be good enough to earn love. When we learn that being WITH our Father is the most important thing He desires for our lives; it then becomes easy to reprioritize our life around faith and not the other way around. To that end I have (New Years resolution) MADE the time to rediscover my morning connection to God’s word. I have moved around my schedule at work and set aside 2 hours every morning for prayer, God’s word, exercising, making healthy meals for the day, and most importantly given myself the opportunity to connect to Him through this blog again! Our Father is not standing over us waiting for us to fail or give us a treat if we do good. 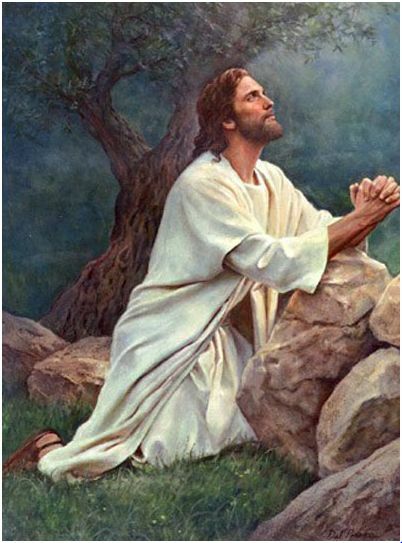 Jesus’ prayer and purpose was to glorify God the Father through perfect obedience to His will for Him. And His goal was that we may experience the Peace and Joy intended for us since creation. We should not ever let anything stand in the way of that relationship. Not sin, not laziness, not addictions, not playing a victim to circumstances or past demons. Joy is knowing who we are because we are confident in Whose we are. Unspeakable Joy Father, that You desire that for all who come to You and hunger to know more of You and follow You. I can’t even fathom Lord that after 5 years of sobriety (Jan 3, 2011) and being in relationship with You I have been so lost in still trying to think there is more I need to do. There is nothing I need to do but enter into Your presence and STAY THERE. My fears in the world, self doubts, frustrations, longings… none of it has power to steal joy and peace unless I take my eyes and heart off of You first. I thank You for the trials Father, for the always lead directly to You. My deepest prayer Lord is that all your children come to You this day knowing what we do will always be secondary to our character; who we are. Today Lord I seek nothing more than to be in Your arms and loving Your creation as You loved us. Thank you Jesus. This entry was posted in Addiction, bible study, encouragement, faith, God's story, hope, Jesus, love, my story, Recovery, Salvation and tagged character, discipline, jesus, John 17, joy, obedience, peace, salvation. Bookmark the permalink.